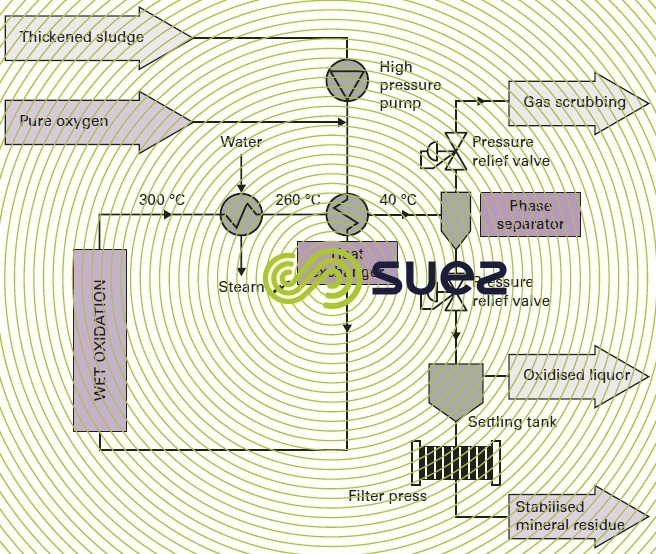 This process is outlined in figure 50.
reduced sludge exchanger- pre-heater exchange capacity. As we have already seen, incoming sludge must have a minimum net calorific value of at least 25 g· L–1 of COD, beyond which the process becomes self-sufficient in terms of heat. When the figures for incoming sludge are higher, in the region of 50 or even 80 g· L–1 of COD, the installations heat balance becomes exothermic and re-use as steam becomes an option. Should this not be the case, the calories are released into the atmosphere. Nevertheless, the COD concentration must not rise beyond a maximum level, approximately 120 g· L–1, beyond which the temperature becomes difficult to control. The process takes place in a bubble column, rising current type reactor. This system has only one single outlet. From a hydrodynamic viewpoint, this design promotes excellent temperature homogeneity. Additionally, it will cool all outgoing products prior to expansion and phase separation. This low temperature phase separation option is essential with regard to process safety since there are no high pressure gas pockets inside the reaction and since, consequently, they cannot expand. This layout also has the advantage of avoiding, to the highest possible extent, metal and water volatisation because expansion takes place at a low temperature. Furthermore, this process avoids the formation of corrosive salt deposits (sulphates, chlorides…) on the reactor walls in gaseous zones and, accordingly, wall corrosion. It will also allow several reactors to be operated in series which is of interest to units processing very high tonnages. Once expansion has been completed, the solid residue is then separated from the liquid by sedimentation before being dewatered by a filter press without the need of any treatment involving chemical reagents; if the mineral cake is washed, this will help to reduce its low organic mineral content even further. The final phase in the process then consists in polishing the liquid phase: in effect, the separated liquid is rich in easily biodegradable COD and in ammonia. The COD mainly consists of acetic acid (the level of this compound will rise with the reaction temperature) and can, therefore, be re-used for denitrification when it is returned to the treatment inlet. On the other hand, this COD is linked to a high level of ammonia and this makes the value of this recycling less obvious because the COD then has to be used to denitrify the nitrates formed from this ammonia. Consequently, it is better to eliminate this COD before any returns are made to the plant inlet.